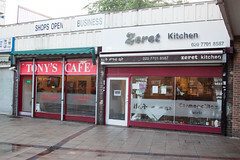 First of all, Monday is a good day to go to Zeret. They are open on Mondays, but it’s not a particularly busy night, so they really rolled out the hospitality for us (that, and when my brother and sister-in-law, who know the owner, joined us, the owner realized I was the person who had previously reviewed the place). We were seated at a pleasant corner table, and next thing you know, we had Ethiopian beers (St George) and a giant mixed platter of Chicken Tib (sauteed chicken) various Wats (stew), and a variety of vegetables, all served over a nice platter of spongy but tangy injera. 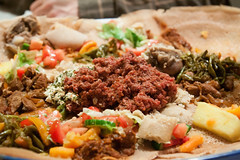 And, most importantly, a large serving of kitfo, the spicy marinated raw beef that I love getting at Ethiopian places. Like before, the Kitfo was particularly nice, with a rich and very spicy marinate heavy with chile powder, but still a strong beef note coming from the underlying beef. This was a wonderful treat in both flavor and texture. 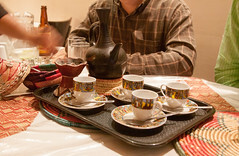 Finally, our meal concluded with an Ethiopian coffee service, with the beans roasted at the table. We soon had a full service with a rich, bold, and flavorful coffee served up at the table. Overall, this was a splendid meal, and I’m happy to see that Zeret continues to produce some quality Ethiopian food years after my first visit.